One of the most common challenges for organizations on the Agile journey is navigating the gap between adoption and transformation. For example, a football play can look great on the chalkboard and the concept may be a winner, but it won’t go anywhere without sound communication and implementation. For a play to work, each player must internalize their individual role and know how it fits in the overall vision so well that, in action, they can execute the play. Just as a sound process for designing, communicating, and mastering football plays leads to a winning team, a successful Agile transformation leads to quicker time-to-market, better customer engagement, and more efficient outcomes. A critical element in the journey from adoption to transformation is organizational communication. 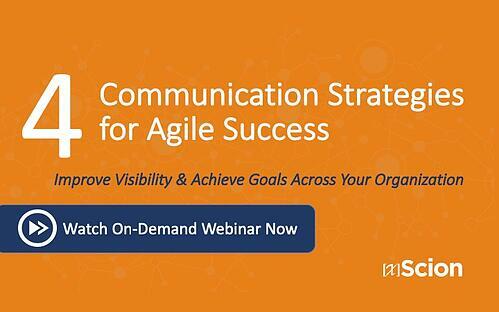 In the on-demand webinar, “4 Communication Strategies for Agile Success”, xScion’s Bhavani Krishnan and Mason Chaudhry draw on their expertise and experience to share communication strategies with broad applications useful in any organization. Rather than offer cookbook style solutions, they engage in a conversation that introduces general concepts and various specific implementation strategies. The Big Picture - how to best communicate the big picture to stakeholders as a foundation for collective ownership of strategy and vision. Shifting Priorities - why it is important to rapidly communicate shifts in priorities across all stakeholders to minimize costs of delay. Decision Making - how to determine when centralized or decentralized decision making is best. Measuring Success - what to measure and how to communicate it for continuous, incremental improvement. Successful communication is a key ingredient in the transformation from initial adoption to the authentic mindset and culture changes that set the stage for positive outcomes. The strategies shared in this webinar can help you navigate some of the most common challenges organizations face. Look for upcoming blog posts that focus on each of the four communication strategies and watch the webinar anytime, anywhere on-demand here. It offers great ideas for communication strategies as well as anecdotes, examples, and suggestions that draw from others’ experience on the Agile journey.